As part of our Style Chicks 2018 Hair and Skin Care Series, we’re exploring the advantages of home light therapy for improving skin. LED light therapy builds collagen, reduces wrinkles, improves acne, fades discoloration and scars. A high-quality light therapy device is a worthwhile investment. 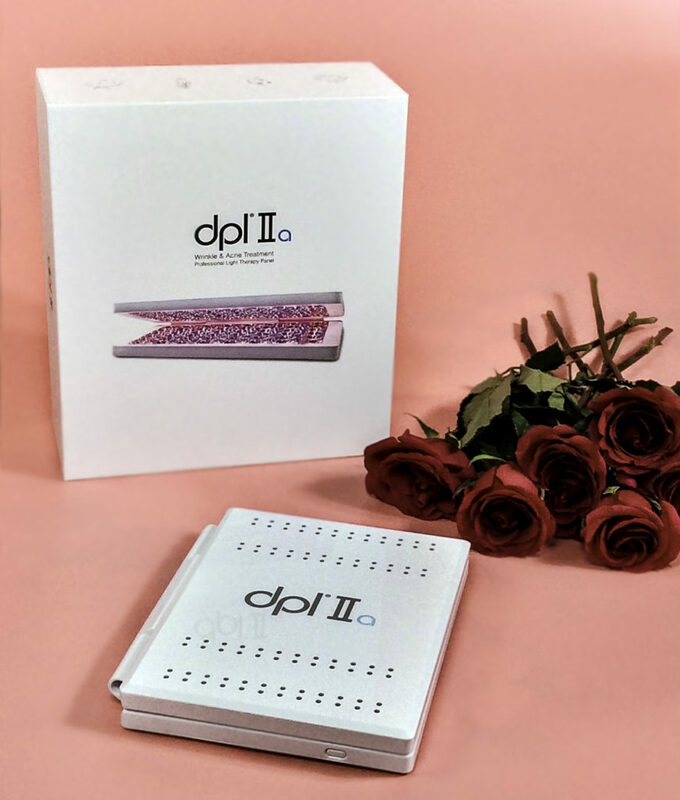 We recently tried the reVive dpl® IIa – Professional Wrinkle Reduction and Acne Treatment Light Therapy, which is an FDA-cleared, OTC Class II medical device that’s a lightweight panel big enough to cover the entire face at once. 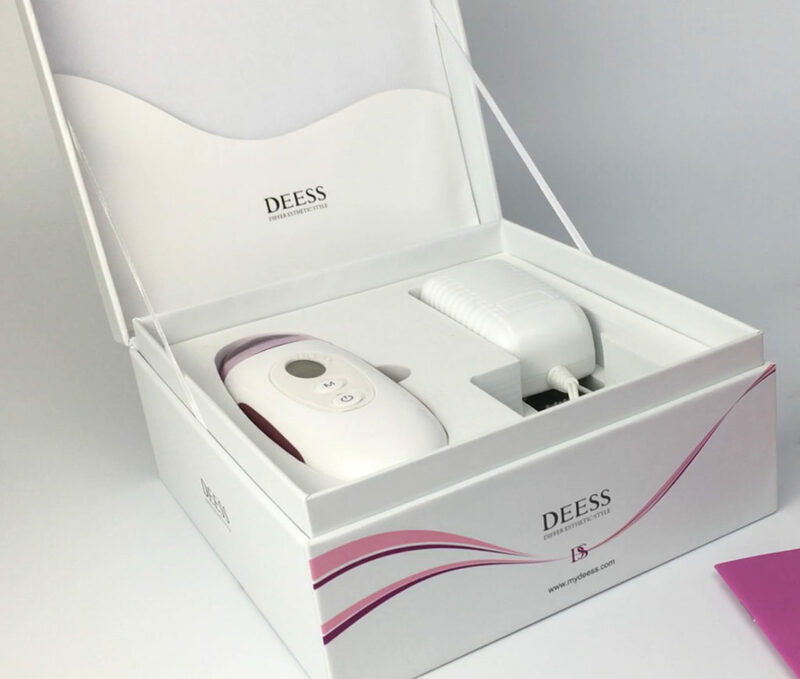 It uses powerful LED diodes that emit safe light therapy that tackles acne and wrinkles while building collagen. Backed by numerous clinical studies, blue and red light therapy are both effective, pain-free, chemical-free, non-invasive way to improve the skin’s texture, tone, and firmness. This device is for acne treatment and wrinkles. Today we focus primarily on the anti-wrinkle/anti-aging aspect of this device. It reduces wrinkles by promoting collagen production. More collagen means stronger, more elastic skin with less sagging. 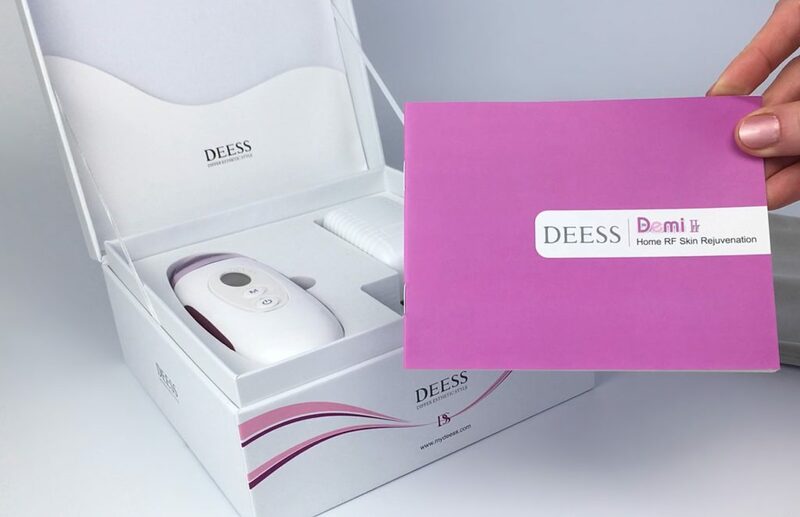 The device also improves skin tone, texture and reduces hyperpigmentation, which promotes the appearance of healthy, glowing, and youthful skin. 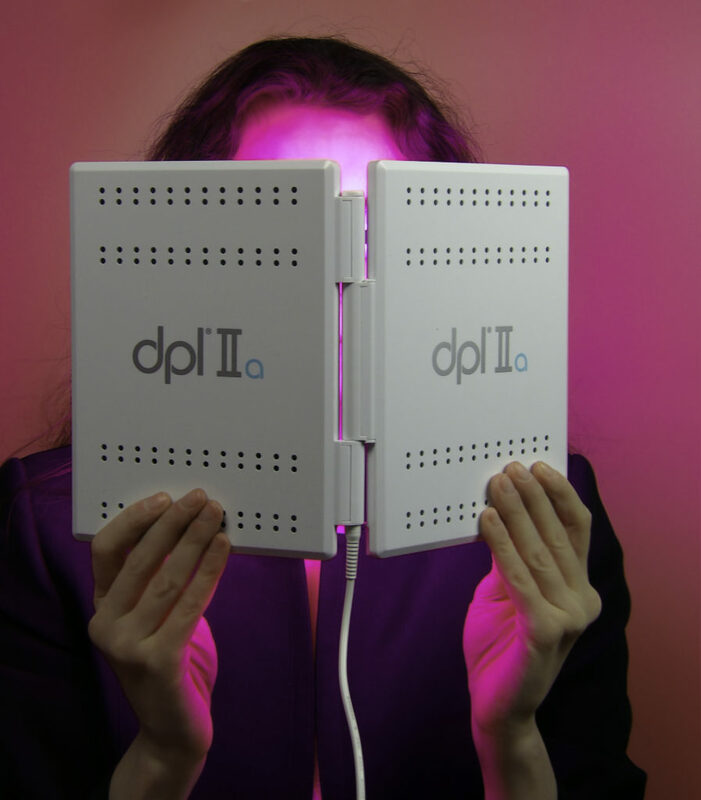 The reVive dpl® IIa is the only full-face professional light therapy devices with FDA clearance for in-home use. HOW DOES THE REVIVE DPL® IIa RATE? 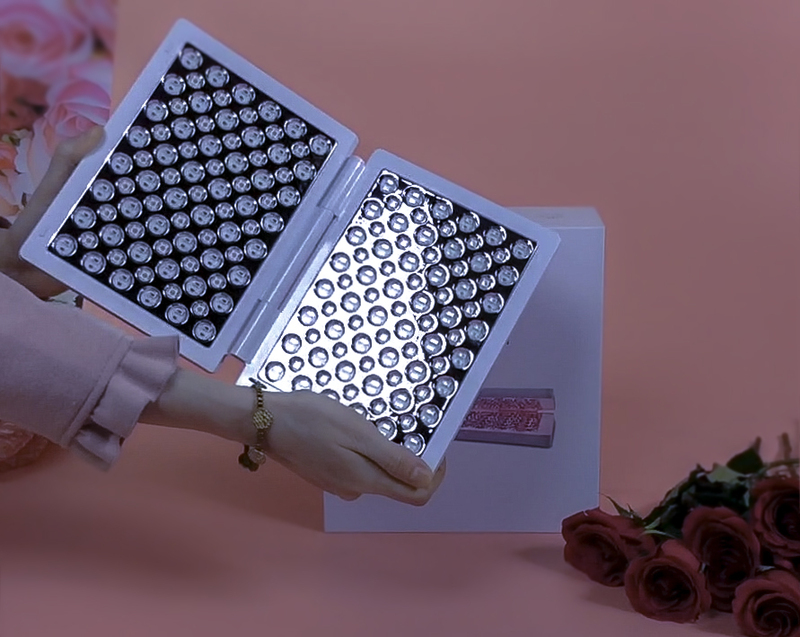 As beauty bloggers, we’ve tried many at-home light therapy products. The reVive DPL® IIa is in a class by itself. This light is powerful and consistently even, and feels much more like an in-office caliber treatment than other commercially available light therapy devices we’ve tried. The goggles say optional, but in my opinion, they are mandatory. The reason is that even with the goggles AND my eyes closed, I can still see the brightness of the light, just like a professional in-office IPL or light therapy treatment. But I do like using these goggles, though, as they’re designed to fit just over the actual eye, exposing the maximum amount of orbital skin area for treatment. This allows dark circles, sagging upper lids and browbones, and the general orbital skin to get treatment, including crow’s feet. The goggles are adjustable to be secure but comfortable. This book-sized device covers your entire face (and much of throat) at once, making for faster and evener treatment. This device produces a powerful light! The whole wall behind you will be illuminated with color like a neon sign. Once you see that, other at-home light therapy devices pale in comparison. It’s not that other devices can’t deliver results, but if I’m going to spend the time and money do light therapy at home, I want a powerfully effective device. Choose the red or blue light setting, or use both at once. RED LIGHT jump-starts tissue rejuvenation by increasing blood flow and collagen stimulation. Red light therapy significantly improves skin complexion, tone, and texture. It also reduces roughness, wrinkles, and fine lines. In clinical studies, Ultrasonographic tests show red light therapy increases collagen. BLUE LIGHT is used to treat acne because it eliminates bacteria, reduces inflammation and redness, stabilizes oil glands, fades old and new scars and discoloration. This is especially helpful for adult acne, as the harsh drying methods we may have used as a teen are too rough on adult skin, especially wrinkling skin. Treat wrinkles and acne simultaneously with both red and blue light. This mode uses all of the colored light diodes for a super powerful light therapy treatment. The combo of works very effectively for wrinkles and maximizes light therapy based collagen production while fading discoloration and redness. Interested in the expanded details on how these specific colors of light therapy work from a clinical view? Read our upcoming post covering all the need to know science behind home light therapy. It’s comfortable on the skin, there is no burning or any discomfort at all, it’s quite relaxing. 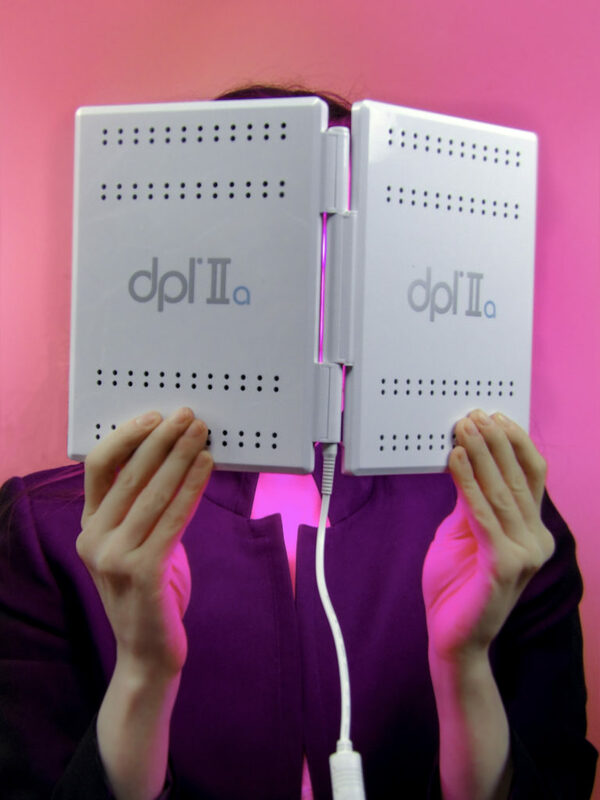 The device opens like a book, and it’s easy to hold the device for treatment right on the face. It’s lightweight like a Kindle tablet and can be propped up if needed. It beeps at every minute interval until the treatment is over and it shuts itself off. TIP: Before a light therapy session, apply an SPF-free serum or moisturizer for maximum benefit. This device is a collagen-building lifesaver for those with sensitive skin who cannot tolerate Vitamin C serums or Retinol because it works without any irritation, redness or dryness. The reduction of wrinkles, fine lines, and crows feet are the hallmark of this light therapy device. My eleven lines appeared less deep and long even after a few uses. I find both eleven and smile lines look much smoother the day after I use the reVive DPL® IIa and my skin appears brighter. I’m particularly happy with the ability to treat the eye area including crows feet, my undereye area gets a nice treatment of wrinkle reduction and lightening discoloration. The long-term ability to build collagen along the upper eyelid and browbone turns back time in a way that a topical eye cream alone cannot. When I use the device at night before bed, my skin also has a lovely glow to it in the morning, I look more vibrant and awake, my skin tone seems more rosy and even. Since using the device, I tend to use less foundation and concealer so the glow of my skin can shine through. 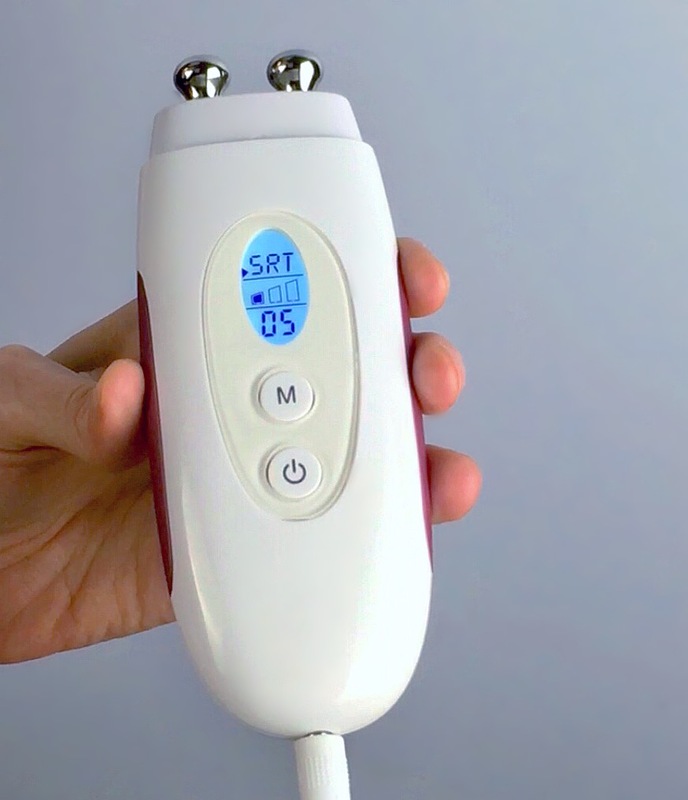 An outstanding addition to your at-home anti-aging arsenal, the reVive dpl® IIa – Professional Wrinkle Reduction and Acne Treatment Light Therapy provides powerful, professional quality results in an easy-to-use device that takes just minutes to use. This highly worthwhile investment treats face, throat, decolletage, and hands whenever you want. This FDA-cleared, OTC Class II medical device is lightweight and covers the entire face at once for fast, even treatment. The three light mode settings deliver precious collagen building therapeutic light, which over the course of a few months, makes a meaningful difference in the strength, firmness, texture, and appearance of skin. Treating adult acne and wrinkles at the same time is tricky business. Up next is all the details on using reVive dpl® IIa – Professional Wrinkle Reduction and Acne Treatment Light Therapy for acne treatment. 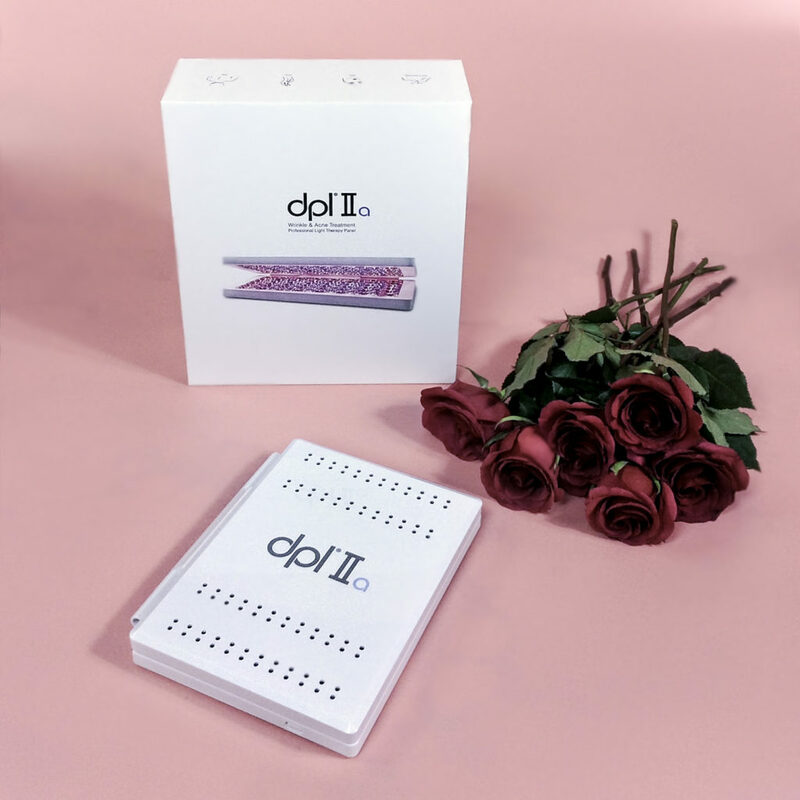 Style Chicks received the reVive dpl® IIa – Professional Wrinkle Reduction and Acne Treatment Light Therapy Panel for review purposes. However, our experience with the product and the opinions expressed in this review are 100% ours.